Handling of player knowledge of various things. Knowledge is specific for a player, and organized in 'items'. One item is a specific formulae or monster, whatever is coded. Note that some things are done through functions in readable.c, especially item marking. Knowledge is persistent and without errors. Maybe that could be changed in the future? Only use non static functions when using this file. Loading is done on a per-demand basis, writing at each change. Knowledge is stored in a "player.knowledge" file in the player's directory. Knowledge relies on key/values. Key is "knowledge_marker", value is specific to the item class considered and must have a left-side part, delimited by a double dot, specifying a type. The value should be enough to determine a unique formulae or monster etc. A type is linked to various functions for displaying, checking the key value. During loading, obsolete items (eg formula changed) are discarded. If the client has notifications support of at least 2, then knowledge information is sent as needed, incrementally as to not freeze the server. Add knowledge information to the player's knowledge. current where to add the information to. item what to add, format specific to the type. type pointer of the handler type. pl who we're adding the information for. count of actually added items. Definition at line 100 of file knowledge.c. Attempt an alchemy based on the specified knowledge. pl who attempts the recipe. item item to attempt, must not be NULL. Definition at line 126 of file knowledge.c. Check if an item can be used for a recipe, and fill the return buffer if it's the case. item item's name, including title if there is one. buf where to put the results. If NULL a new one can be allocated. index the knowledge index for this item. buf, if it was NULL and the recipe uses the item, a new one is allocated. Definition at line 110 of file knowledge.c. Function to fill the StringBuffer with a detailed description of an item. buf where to write the description, must not be NULL. Definition at line 83 of file knowledge.c. Get the face for a knowledge item. face number, -1 (as unsigned) for invalid. Definition at line 117 of file knowledge.c. Function to check if the specified item is valid. 0 if invalid, non 0 if valid. Definition at line 90 of file knowledge.c. One known item for a player. Function to fill the StringBuffer with the short description of an item. buf where to write the summary, must not be NULL. Definition at line 76 of file knowledge.c. Handle the 'knowledge' for a player. pl who is using the command. Definition at line 1221 of file knowledge.c. 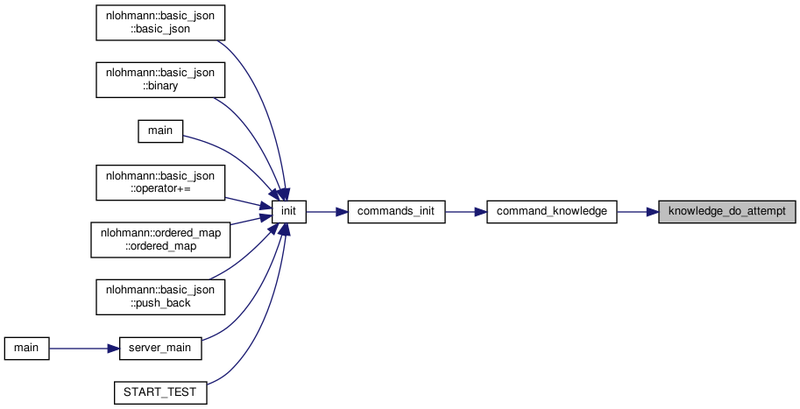 References command_help(), obj::contr, knowledge_display(), knowledge_do_attempt(), knowledge_do_display(), knowledge_show(), llevError, LOG(), and obj::name. Definition at line 1288 of file knowledge.c. References free_knowledge_player(), knowledge_global, and knowledge_player::next. Free all knowledge items for a player. Definition at line 1260 of file knowledge.c. References free_string(), knowledge_item::item, knowledge_player::item_allocated, knowledge_player::item_count, and knowledge_player::items. Totally free a knowledge structure, and its items. kp structure to free, becomes invalid. Definition at line 1279 of file knowledge.c. References free_knowledge_items(), free_string(), and knowledge_player::player_name. 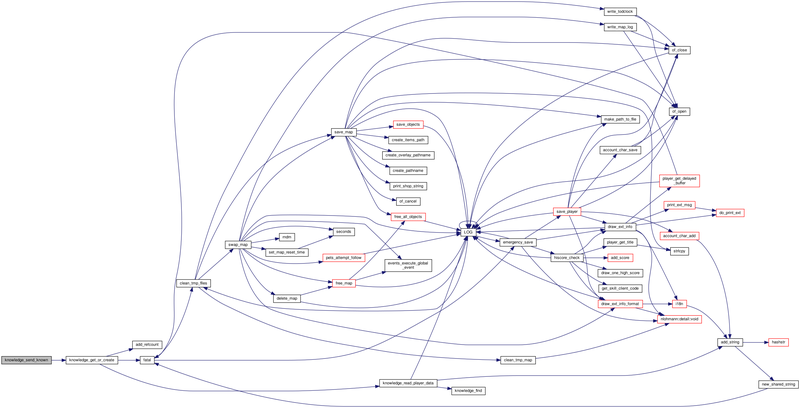 Referenced by free_knowledge(), and knowledge_process_incremental(). Add a knowledge item to a player's store if not found yet. current where to look for the knowledge. item internal value of the item to give, considered atomic. kt how to handle the knowledge type. pl who we're adding the information to. 0 if item was already known, 1 else. Use malloc instead of calloc here. We're setting all relevant values, anyway. Definition at line 561 of file knowledge.c. References add_string(), knowledge_item::handler, knowledge_item::item, knowledge_player::item_allocated, knowledge_player::item_count, knowledge_player::items, and knowledge_known(). 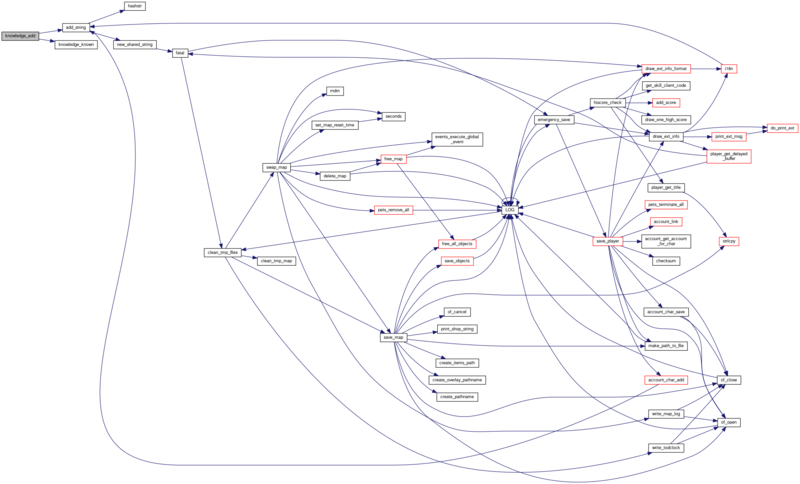 Referenced by knowledge_god_add(), and knowledge_monster_add(). Attempt an alchemy recipe through the knowledge system. pl who is attempting the recipe. item knowledge item, should be of type recipe. Definition at line 344 of file knowledge.c. References apply_by_living_below(), obj::arch, obj::below, recipestruct::cauldron, command_take(), obj::container, obj::count, draw_ext_info(), draw_ext_info_format(), examine(), FLAG_INV_LOCKED, FLAG_STARTEQUIP, recipestruct::ingred, recipestruct::ingred_count, obj::inv, knowledge_item::item, knowledge_alchemy_get_recipe(), llevError, LOG(), obj::map, MAX_BUF, MSG_TYPE_COMMAND, MSG_TYPE_COMMAND_INFO, linked_char::name, knowledge_type::name, archt::name, NDI_UNIQUE, linked_char::next, obj::nrof, pl::ob, object_was_destroyed, put_object_in_sack(), QUERY_FLAG, safe_strncpy, snprintf, obj::speed_left, knowledge_type::use_alchemy, obj::x, and obj::y. Definition at line 294 of file knowledge.c. 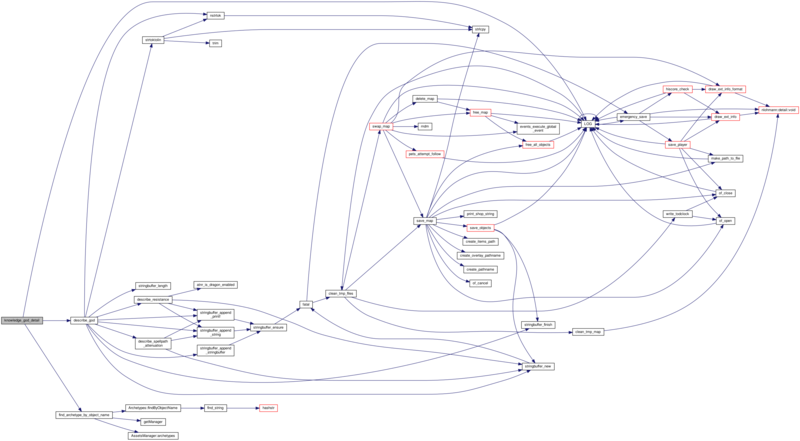 References recipestruct::arch_name, recipestruct::arch_names, archt::clone, find_archetype(), recipestruct::ingred, knowledge_alchemy_get_recipe(), linked_char::name, knowledge_type::name, obj::name, linked_char::next, knowledge_player::next, RANDOM, stringbuffer_append_printf(), stringbuffer_append_string(), stringbuffer_new(), recipestruct::title, and obj::title. Give the full description of the alchemy recpie. buf where to store the detail. Definition at line 237 of file knowledge.c. 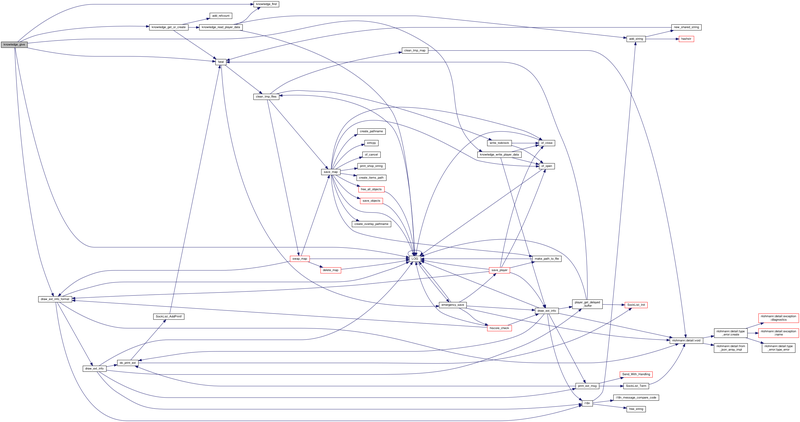 References recipestruct::arch_name, recipestruct::arch_names, recipestruct::cauldron, archt::clone, find_archetype(), recipestruct::ingred, knowledge_alchemy_get_recipe(), MAX_BUF, linked_char::name, knowledge_type::name, obj::name, linked_char::next, knowledge_player::next, query_name(), RANDOM, snprintf, stringbuffer_append_printf(), recipestruct::title, and obj::title. Try to get a face for an alchemy recipe. Definition at line 500 of file knowledge.c. References recipestruct::arch_name, recipestruct::arch_names, arch_to_object(), blank_face, archt::clone, knowledge_type::face, obj::face, find_archetype(), FREE_OBJ_FREE_INVENTORY, FREE_OBJ_NO_DESTROY_CALLBACK, give_artifact_abilities(), artifactstruct::item, knowledge_alchemy_get_recipe(), llevError, locate_recipe_artifact(), LOG(), new_face_struct::number, object_free2(), object_give_identified_properties(), and recipestruct::title. Get a recipe from the internal code. value code to get value for. recipe, NULL if not found. Definition at line 169 of file knowledge.c. References get_formulalist(), recipestruct::index, recipeliststruct::items, recipestruct::next, and recipestruct::title. 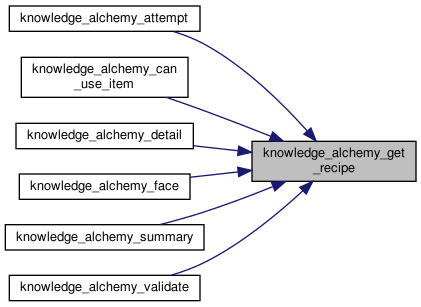 Referenced by knowledge_alchemy_attempt(), knowledge_alchemy_can_use_item(), knowledge_alchemy_detail(), knowledge_alchemy_face(), knowledge_alchemy_summary(), and knowledge_alchemy_validate(). Give the title of the alchemy recpie. buf where to put the information. Definition at line 207 of file knowledge.c. References recipestruct::arch_name, recipestruct::arch_names, archt::clone, find_archetype(), knowledge_alchemy_get_recipe(), obj::name, RANDOM, stringbuffer_append_printf(), recipestruct::title, and obj::title. Check if an alchemy recipe is still ok.
0 if non valid, 1 else. Definition at line 282 of file knowledge.c. Display all a player's knowledge. pl who to display knowledge of. Definition at line 1141 of file knowledge.c. 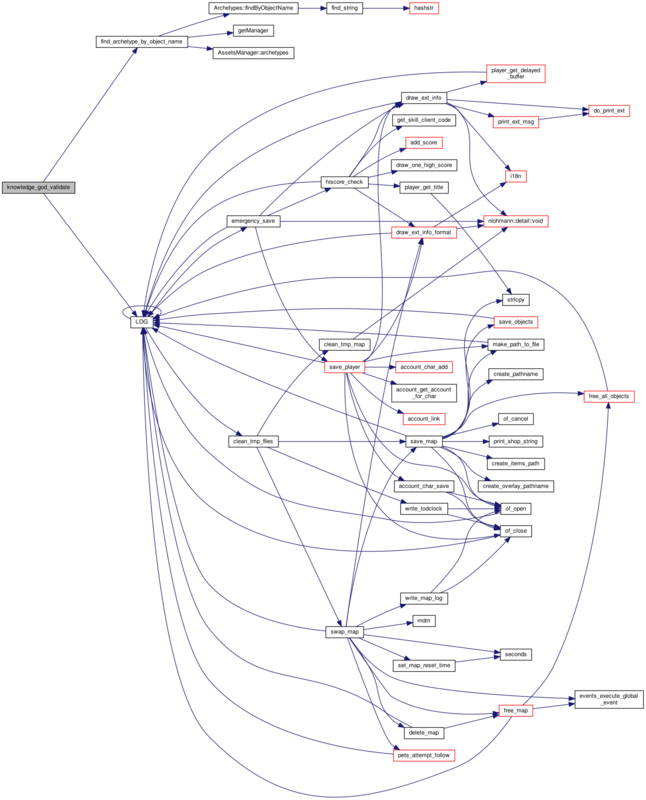 References draw_ext_info(), draw_ext_info_format(), knowledge_do_display(), MSG_TYPE_CLIENT_NOTICE, MSG_TYPE_MISC, knowledge_type::name, NDI_UNIQUE, and knowledge_type::type. Player attempts something on a knowledge, get item and try it. Definition at line 1197 of file knowledge.c. References knowledge_type::attempt_alchemy, obj::contr, draw_ext_info(), knowledge_item::handler, knowledge_player::item_count, knowledge_player::items, knowledge_get_or_create(), MSG_TYPE_COMMAND, MSG_TYPE_COMMAND_INFO, and NDI_UNIQUE. pl who to display to. show_only if not NULL, only display this knowledge type. search if not NULL, only display items having the summary or detail contain the string. Must be either NULL or a non empty string. Definition at line 1076 of file knowledge.c. 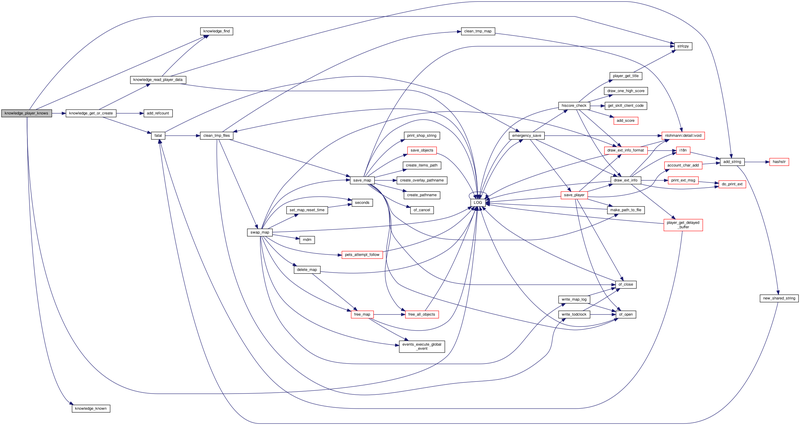 References obj::contr, knowledge_type::detail, draw_ext_info(), draw_ext_info_format(), knowledge_item::handler, knowledge_item::item, knowledge_player::item_count, knowledge_player::items, knowledge_get_or_create(), MSG_TYPE_CLIENT_NOTICE, MSG_TYPE_MISC, knowledge_type::name, NDI_UNIQUE, stringbuffer_finish(), stringbuffer_new(), knowledge_type::summary, and knowledge_type::type. 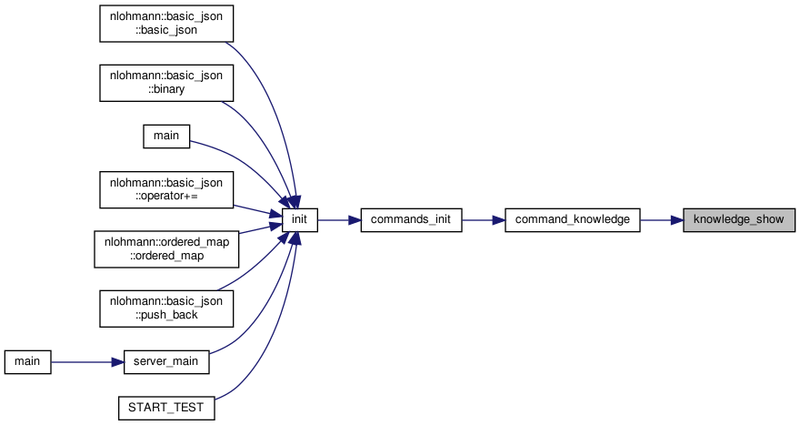 Referenced by command_knowledge(), and knowledge_display(). Find a knowledge handler from its type. handler, NULL if not found. Definition at line 880 of file knowledge.c. 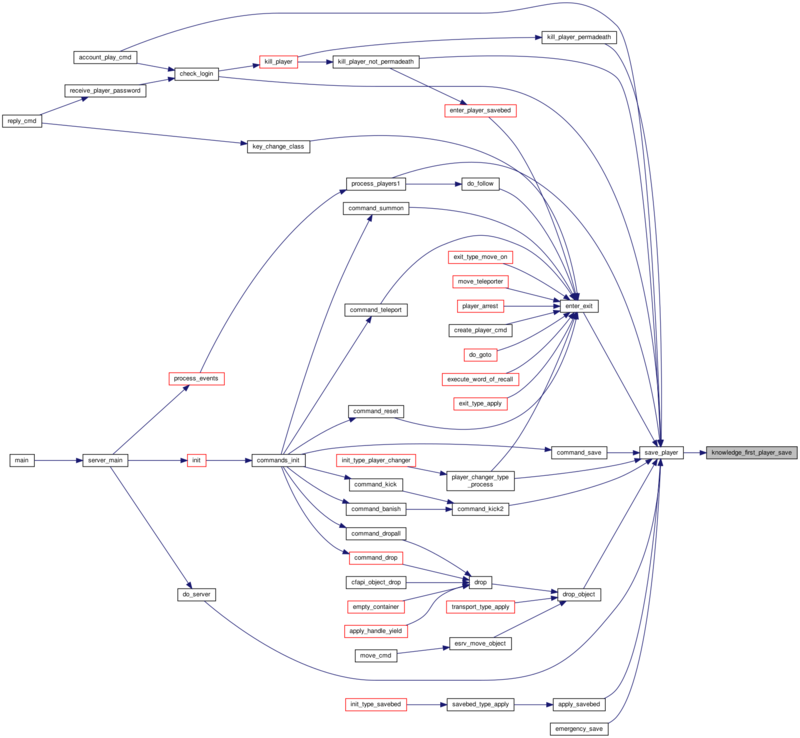 Referenced by knowledge_give(), knowledge_player_knows(), and knowledge_read_player_data(). Ensure the knowledge state is correctly saved for the player. This function should only be called once, when the player's save directory is created. All other knowledge functions save the state automatically, but save can only happen when the player directory exists. pl who to save the state for. Definition at line 1431 of file knowledge.c. References knowledge_global, knowledge_write_player_data(), obj::name, knowledge_player::next, pl::ob, and knowledge_player::player_name. Find or create the knowledge store for a player. Will load data if required. fatal() will be called if memory failure. pl who to find data for. Definition at line 981 of file knowledge.c. References add_refcount(), fatal(), knowledge_global, knowledge_read_player_data(), obj::name, knowledge_player::next, socket_struct::notifications, pl::ob, OUT_OF_MEMORY, knowledge_player::player_name, knowledge_player::sent_up_to, and pl::socket. 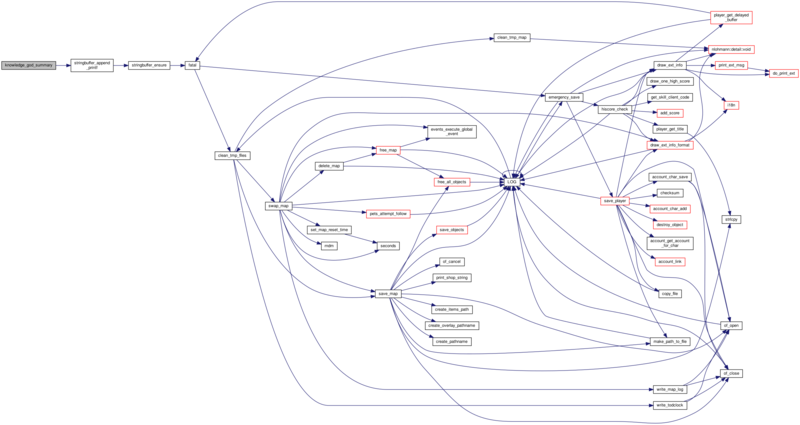 Referenced by knowledge_do_attempt(), knowledge_do_display(), knowledge_give(), knowledge_item_can_be_used_alchemy(), knowledge_player_knows(), knowledge_send_known(), knowledge_show(), and knowledge_show_monster_detail(). Give a knowledge item from its code. pl who to give the knowldge to. book optional item containing the knowledge code. Definition at line 1009 of file knowledge.c. 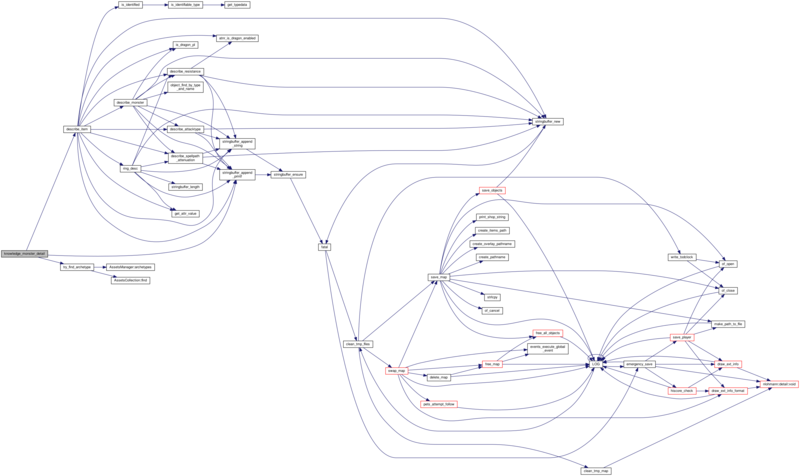 References knowledge_type::add, draw_ext_info(), fatal(), pl::has_directory, knowledge_player::items, knowledge_find(), knowledge_get_or_create(), knowledge_write_player_data(), llevError, LOG(), MSG_TYPE_CLIENT_NOTICE, MSG_TYPE_MISC, obj::name, NDI_UNIQUE, pl::ob, OUT_OF_MEMORY, knowledge_type::type, and knowledge_type::validate. 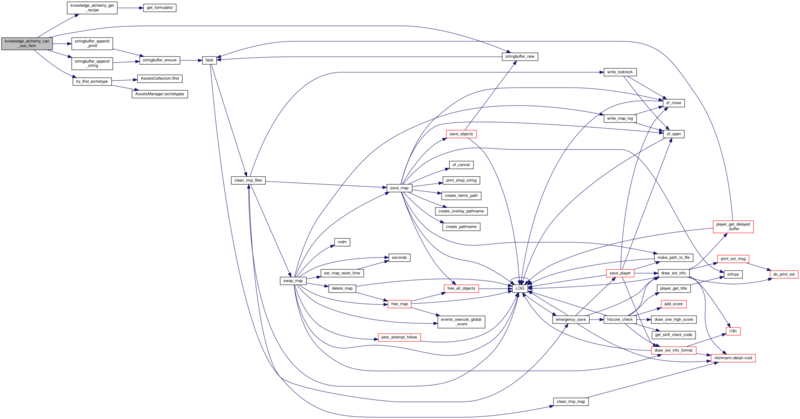 Referenced by cfapi_player_knowledge(), and knowledge_read(). Add god information to the player's knowledge, handling the multiple monster case. item god to add, a dot separating the exact knowledge. type pointer of the monster type. Definition at line 741 of file knowledge.c. 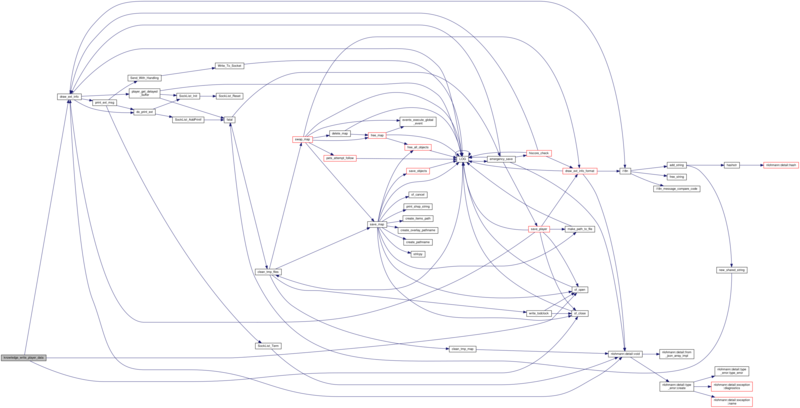 References free_string(), knowledge_item::handler, knowledge_item::item, knowledge_player::item_count, knowledge_player::items, knowledge_add(), llevError, LOG(), strdup_local, stringbuffer_append_printf(), stringbuffer_finish_shared(), and stringbuffer_new(). Describe in detail a god. item knowledge item for the god (object name and what is known). buf where to put the description. Definition at line 689 of file knowledge.c. References archt::clone, describe_god(), find_archetype_by_object_name(), llevError, LOG(), and strdup_local. Get the face for a god. face, -1 as unsigned if invalid. Definition at line 787 of file knowledge.c. References archt::clone, obj::face, find_archetype(), MAX_BUF, new_face_struct::number, snprintf, and tolower. Definition at line 673 of file knowledge.c. Check if a god knowledge item is still valid. 0 if invalid, 1 if valid. Definition at line 718 of file knowledge.c. References find_archetype_by_object_name(), llevError, LOG(), and strdup_local. Displays known alchemy recipes an item can be used in. op who to display recipes for. item what to check formulae for. Definition at line 1342 of file knowledge.c. 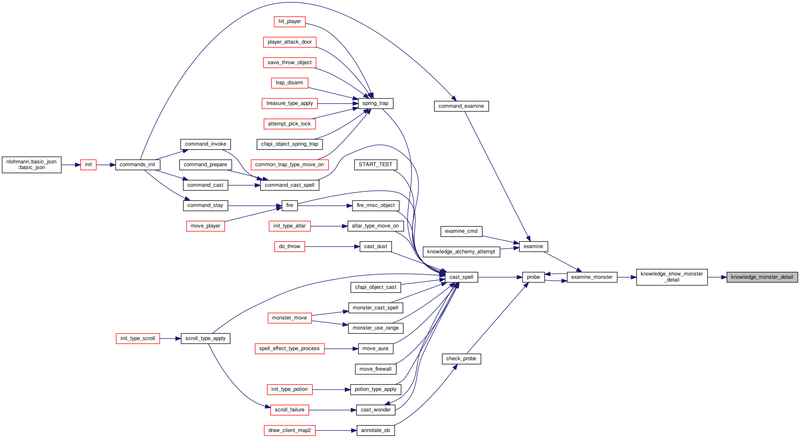 References obj::contr, draw_ext_info(), knowledge_item::handler, knowledge_item::item, knowledge_player::item_count, knowledge_player::items, knowledge_get_or_create(), MAX_BUF, MSG_TYPE_COMMAND, MSG_TYPE_COMMAND_EXAMINE, knowledge_type::name, obj::name, NDI_UNIQUE, PLAYER, snprintf, stringbuffer_append_string(), stringbuffer_finish(), obj::title, obj::type, and knowledge_type::use_alchemy. Check whether a player already knows a knowledge item or not. item what to check for. kt the knowledge type for item. 0 if item is known, 1 else. Definition at line 542 of file knowledge.c. References knowledge_item::handler, knowledge_item::item, knowledge_player::item_count, knowledge_player::items, and knowledge_type::type. 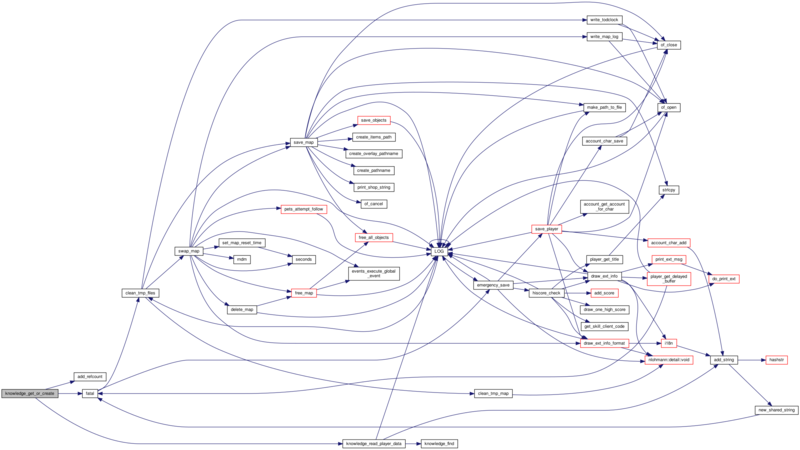 Referenced by knowledge_add(), knowledge_player_knows(), and knowledge_show_monster_detail(). Give the full description of a message. Definition at line 831 of file knowledge.c. References get_message_body(), get_message_from_identifier(), and stringbuffer_append_printf(). Get the face for a message. Definition at line 855 of file knowledge.c. Give the title of a message. Definition at line 815 of file knowledge.c. References get_message_from_identifier(), get_message_title(), and stringbuffer_append_printf(). Check if a message is still valid. Definition at line 846 of file knowledge.c. Add monster information to the player's knowledge, handling the multiple monster case. item monster to add, can be separated by dots for multiple ones. Definition at line 636 of file knowledge.c. Describe in detail a monster. item knowledge item for the monster (archetype name). Definition at line 606 of file knowledge.c. References archt::clone, describe_item(), find_archetype(), obj::name, and stringbuffer_append_printf(). Get the face for a monster. Definition at line 658 of file knowledge.c. References blank_face, archt::clone, obj::face, find_archetype(), and new_face_struct::number. Definition at line 592 of file knowledge.c. References archt::clone, find_archetype(), obj::name, and stringbuffer_append_printf(). Check if a monster knowledge item is still valid. Definition at line 621 of file knowledge.c. References archt::clone, try_find_archetype(), and obj::type. Determines whether a player knows a specific knowledge or not. pl who to check knowledge for. knowledge what to check for, in format "type:(type specific value)". Definition at line 1306 of file knowledge.c. 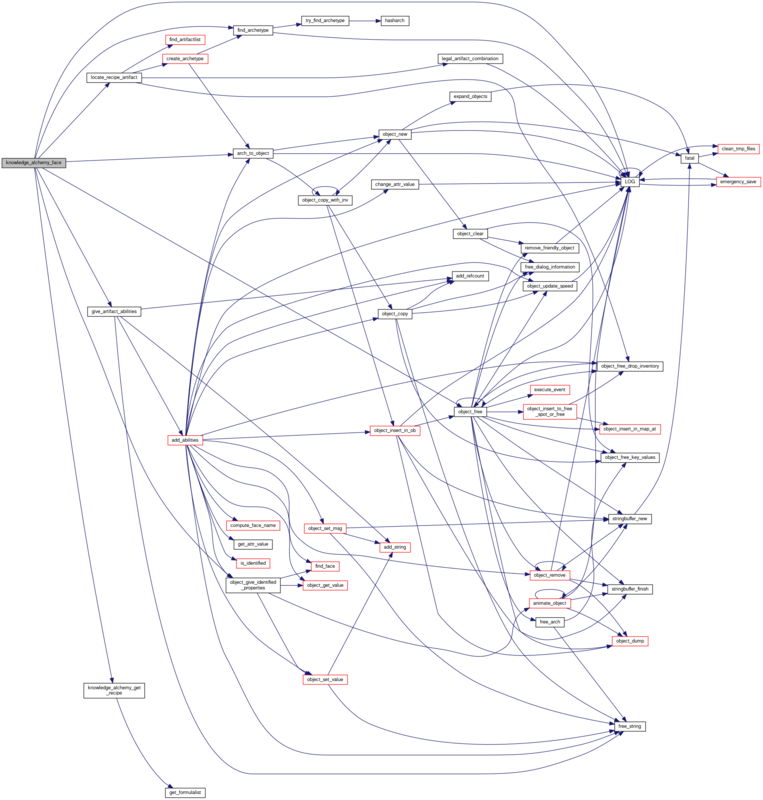 References knowledge_find(), knowledge_get_or_create(), knowledge_known(), llevError, LOG(), MAX_BUF, snprintf, and knowledge_type::type. Incrementally send knowledge information to players, and remove information for players who left. Definition at line 1447 of file knowledge.c. 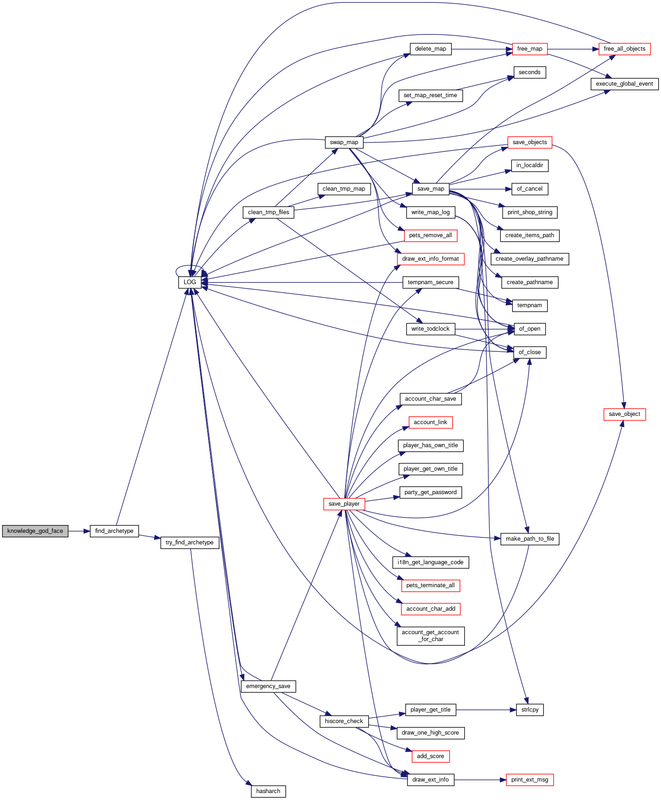 References esrv_send_face(), knowledge_type::face, socket_struct::faces_sent, find_face(), first_player, free_knowledge_player(), knowledge_item::handler, knowledge_item::item, knowledge_player::item_count, knowledge_type::item_face, knowledge_player::items, knowledge_global, MIN, obj::name, pl::next, knowledge_player::next, NS_FACESENT_FACE, pl::ob, knowledge_player::player_name, Send_With_Handling(), knowledge_player::sent_up_to, pl::socket, SockList_AddInt(), SockList_AddLen16Data(), SockList_AddString(), SockList_Avail(), SockList_Init(), SockList_Reset(), SockList_Term(), stringbuffer_finish(), stringbuffer_new(), knowledge_type::summary, and knowledge_type::type. Player is reading a book, give knowledge if needed, warn player, and such. Definition at line 1064 of file knowledge.c. Read all knowledge data for a player from disk, discarding invalid data. kp player structure to load data into. Definition at line 926 of file knowledge.c. 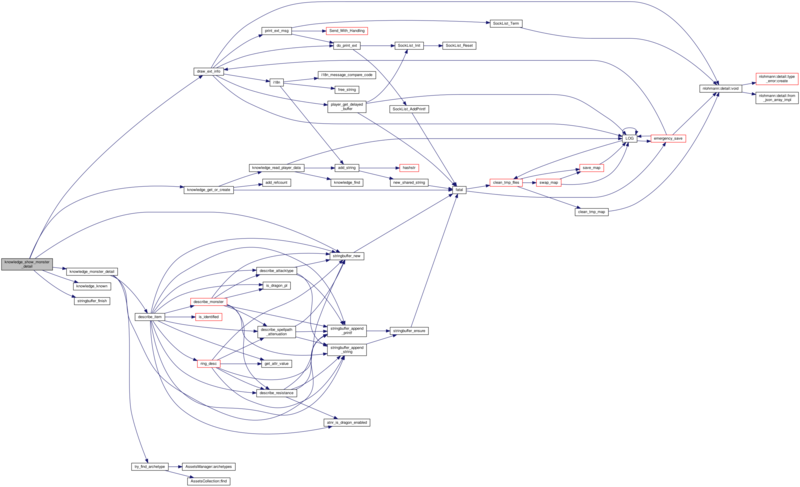 References add_string(), knowledge_item::handler, knowledge_item::item, knowledge_player::item_allocated, knowledge_player::item_count, knowledge_player::items, knowledge_find(), llevDebug, llevError, Settings::localdir, LOG(), MAX_BUF, knowledge_player::player_name, Settings::playerdir, settings, snprintf, knowledge_type::type, and knowledge_type::validate. Send the reply_info for 'knowledge_info'. ns socket to send information to. Definition at line 1382 of file knowledge.c. 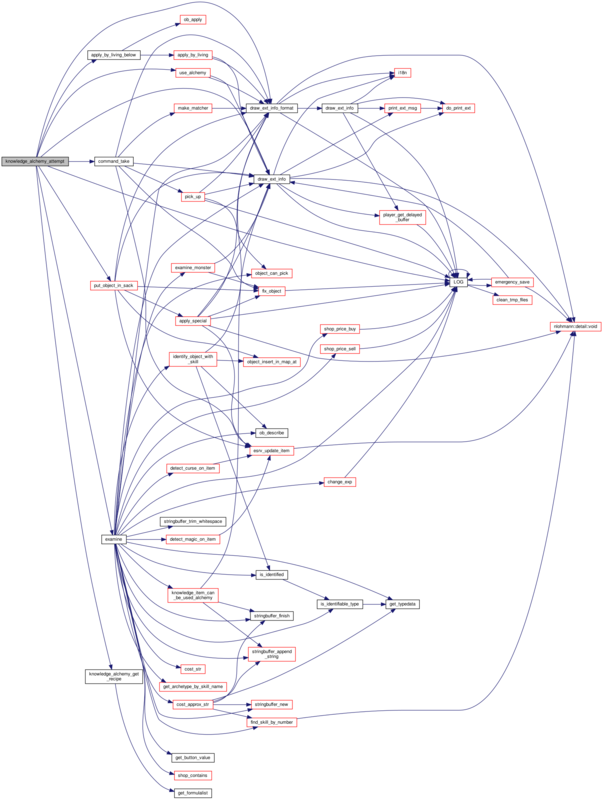 References knowledge_type::attempt_alchemy, esrv_send_face(), knowledge_type::face, socket_struct::faces_sent, find_face(), knowledge_type::name, NS_FACESENT_FACE, Send_With_Handling(), SockList_AddPrintf(), SockList_AddString(), SockList_Init(), SockList_Term(), and knowledge_type::type. Send initial known knowledge to player, if requested. pl who to send knowledge for. Definition at line 1411 of file knowledge.c. References knowledge_get_or_create(), socket_struct::notifications, knowledge_player::sent_up_to, and pl::socket. Show the details of a knowledge item. pl who is asking for details. params additional parameters, should contain the knowledge item number. Definition at line 1171 of file knowledge.c. 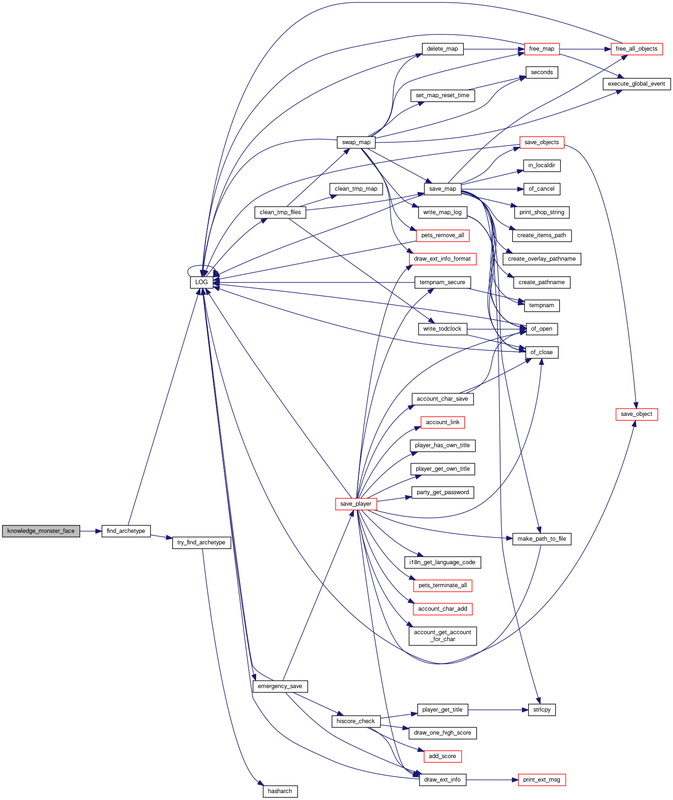 References obj::contr, knowledge_type::detail, draw_ext_info(), knowledge_item::handler, knowledge_item::item, knowledge_player::item_count, knowledge_player::items, knowledge_get_or_create(), MSG_TYPE_CLIENT_NOTICE, MSG_TYPE_COMMAND, MSG_TYPE_COMMAND_INFO, MSG_TYPE_MISC, NDI_UNIQUE, stringbuffer_finish(), and stringbuffer_new(). Display the details of a monster if the player knows them. op player asking for details. Definition at line 1536 of file knowledge.c. 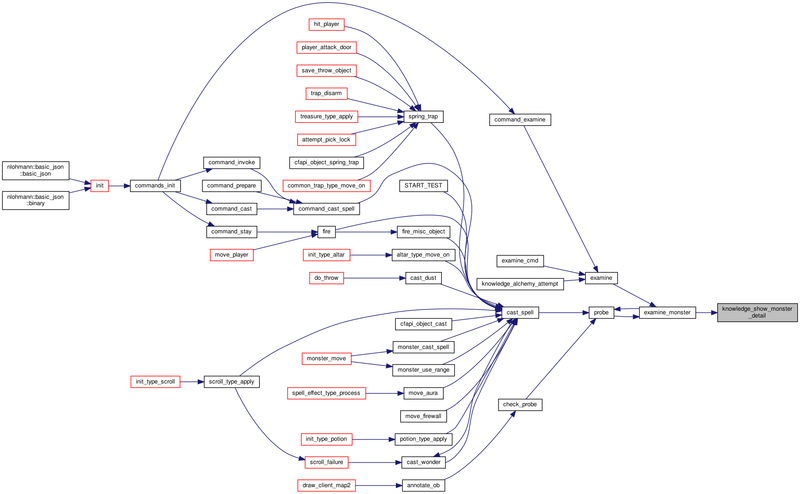 References obj::contr, draw_ext_info(), knowledge_get_or_create(), knowledge_known(), knowledge_monster_detail(), MSG_TYPE_COMMAND, MSG_TYPE_COMMAND_EXAMINE, NDI_UNIQUE, stringbuffer_finish(), and stringbuffer_new(). Store all knowledge data for a player to disk. kp player data to store. Definition at line 895 of file knowledge.c. 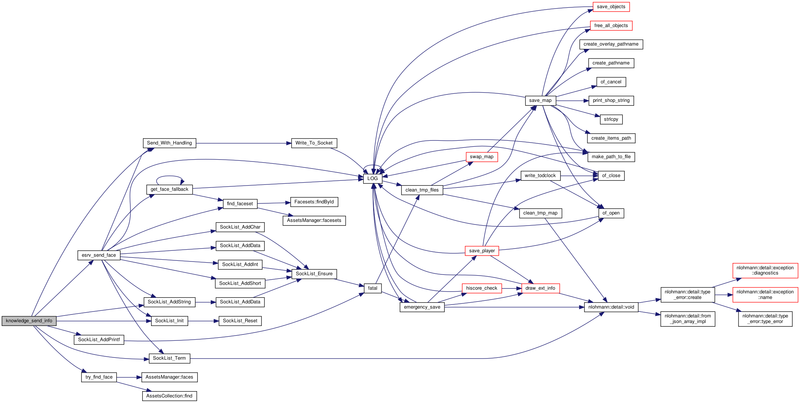 References draw_ext_info(), knowledge_item::handler, knowledge_item::item, knowledge_player::item_count, knowledge_player::items, Settings::localdir, MAX_BUF, MSG_TYPE_ADMIN, MSG_TYPE_ADMIN_LOADSAVE, NDI_ALL_DMS, NDI_UNIQUE, of_close(), of_open(), knowledge_player::player_name, Settings::playerdir, settings, snprintf, and knowledge_type::type. 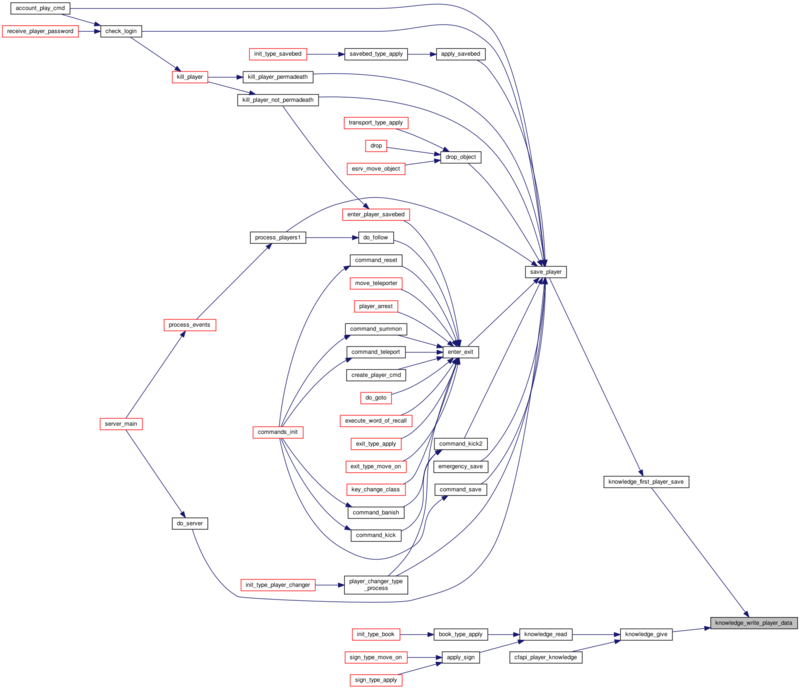 Referenced by knowledge_first_player_save(), and knowledge_give(). All known loaded knowledge for a player. Definition at line 161 of file knowledge.c. 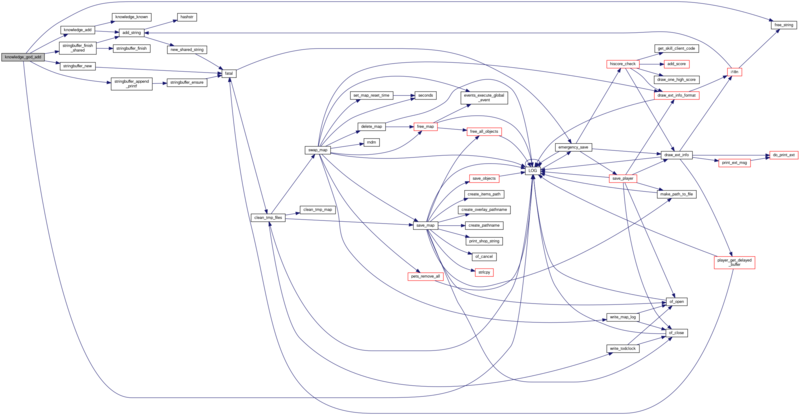 Referenced by free_knowledge(), knowledge_first_player_save(), knowledge_get_or_create(), and knowledge_process_incremental(). Definition at line 866 of file knowledge.c.